Renting a car when you travel can add wonderful sense of freedom, spontaneity, and convenience to your trip. But if you’re like most travelers, you have a few unanswered questions about the process, price, and legal requirements. Our goal at Save70 is to clear up some of the confusion about car rentals and help you hop into the driver’s seat with ease! Are rental cars cheaper to reserve at the last minute? Sometimes. Many rental car companies offer last-minute specials with as little as one hour’s notice. But be sure to read the fine print, because these deals sometimes have terms and conditions that require a minimum number of rental days. Although you may have limited car choice options, Last-minute rentals are a great way to add spontaneity into your trip! Are rental cars cheaper at the airport? Not really. For most travelers, renting a car at the airport is the easiest and most convenient option, which is why companies charge a premium for airport rentals. Local taxes and airport concession fees add up! If your schedule allows, take a shuttle or public transportation from the airport to an off-site rental location instead for cheaper rates. Are car rental facilities open on Sunday? Yes, for most companies. 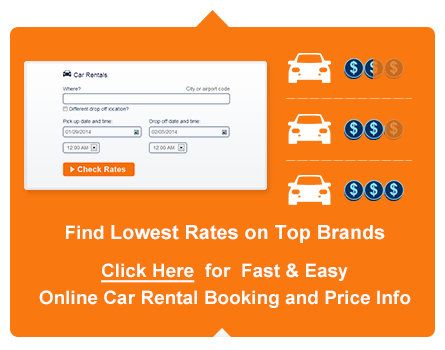 Rental car companies realize that weekend car rentals are a big part of their business and are often open on Sundays. Many rental companies have 24/7 drop-off service as well, which is helpful if you’re dropping your rental car off late Sunday evening. Always check your rental company’s website or call the rental location to verify open days and hours. Yes. Although the legal age to rent a car varies from place to place, 25 is the generally accepted minimum age to rent a car. However, drivers as young as 21, or even 18, can rent a car in some locations by paying an additional underage surcharge fee. The average surcharge per day is usually between $20 and $30 USD. International rental rules vary by country, and some companies and countries even impose an upper age limit for drivers between 70 and 80 years old. Do I need a special license to rent a car? It depends where you are traveling. For example, Americans and Canadians can often drive in Europe with just their home driver’s licenses; however, some countries require an international driving permit (IDP). IDPs are translated into 10 languages and are valid for one year. You can obtain an IDP from American Automobile Association (AAA) or the National Automobile Club for $15. Does a car rental include insurance? No. A car rental rarely includes insurance; however, some drivers may already be covered by the auto insurance policy they have for their own car. But if your auto policy doesn’t include rental insurance, purchasing it at the time of your rental is a good idea to protect you from significant out-of-pocket expenses following an accident. Do car rentals offer unlimited mileage? Yes. Some car rental companies do offer unlimited mileage as an option, so if you plan to drive a lot, then ask about the coverage area and fees. Some companies prohibit travel out of state and out of the country, while others only allow unlimited mileage on weekdays. However, this is a good option for drivers who plan to travel on long road trips and want to avoid overage fees. Can I take a rental car across state and country borders? It depends on the company and destination. Most companies have restrictions on where you can drive their cars, so it’s a good idea to check first with your specific rental location. Crossing state lines is generally less restricted than crossing country borders, but you may need to obtain special permission or pay extra fees to do so. Keep in mind that your driving could be tracked by the rental car company. Are car rentals tax deductible? Yes, for legitimate business expenses. Car rental expenses are generally considered to be travel expenses and can be written off for tax purposes by many business travelers. To be eligible for a tax credit, you should be able to provide documentation that the purpose of your travel was strictly for business. What happens if I get into a car accident in my rental car? Don’t panic. Unfortunately, accidents do happen, and the first thing to do is make sure all involved parties are okay and call for help if anyone is injured. If there is vehicular damage, call the police to file an accident report, exchange information with other involved drivers, and take notes and photos. Contact the rental car company to complete an accident report, and hopefully you initially arranged for insurance coverage through the rental company or your own auto insurance policy. Do car rental companies rent child safety seats? Yes. Almost all rental car companies offer child seats and guarantee their safety. However, some parents are skeptical about using them because there is little way to tell whether they’ve been involved in an accident or how comfortable it will be for your child. Since many airlines allow parents to bring along one child seat for free, you can bring your own to put in the rental car if you don’t mind lugging it around. Will a car rental company check my driving record? It’s very likely. These days, many car rental companies check driving records before handing the over the keys, and you might not even know about it. Companies are required to disclose this information on their websites, but it’s often hiding in the fine print. If you have an invalid or suspended license, chances are that you won’t be allowed to rent a car. Is there an extra charge for an additional driver? Usually, yes. There is almost always an extra fee for each additional person who plans to drive your rental car. This fee is often in the range of $10 to $15 USD. Each driver must show his driver’s license and can also be subject to a driving record check. However, there are exceptions, and some destinations waive this fee for business co-workers, spouses, and other family members on the insurance policy. While those are some of the most common questions travelers have when renting a car at their destination, perhaps you have a few other concerns too. Check out our blog for even more helpful tips and expert recommendations on car rentals, hotels, flights, and travel destinations!